Moses and Aaron encouraged. 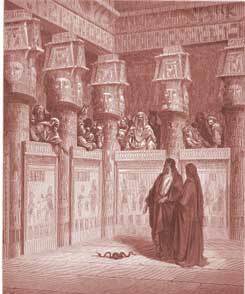 (1-7) The rods turned into serpents, Pharaoh's heart is hardened. (8-13) The river is turned into blood, The distress of the Egyptians. (14-25)1-7 God glorifies himself. He makes people know that he is Jehovah. Israel is made to know it by the performance of his promises to them, and the Egyptians by the pouring out of his wrath upon them. Moses, as the ambassador of Jehovah, speaking in his name, laid commands upon Pharaoh, denounced threatenings against him, and called for judgments upon him. Pharaoh, proud and great as he was, could not resist. Moses stood not in awe of Pharaoh, but made him tremble. This seems to be meant in the words, Thou shalt be a god unto Pharaoh. At length Moses is delivered from his fears. He makes no more objections, but, being strengthened in faith, goes about his work with courage, and proceeds in it with perseverance. 8-13 What men dislike, because it opposes their pride and lusts, they will not be convinced of; but it is easy to cause them to believe things they wish to be true. God always sends with his word full proofs of its Divine authority; but when men are bent to disobey, and willing to object, he often permits a snare to be laid wherein they are entangled. The magicians were cheats, trying to copy the real miracles of Moses by secret sleights or jugglings, which to a small extent they succeeded in doing, so as to deceive the bystanders, but they were at length obliged to confess they could not any longer imitate the effects of Divine power. None assist more in the destruction of sinners, than such as resist the truth by amusing men with a counterfeit resemblance of it. Satan is most to be dreaded when transformed into an angel of light. 14-25 Here is the first of the ten plagues, the turning of the water into blood. It was a dreadful plague. The sight of such vast rolling streams of blood could not but strike horror. Nothing is more common than water: so wisely has Providence ordered it, and so kindly, that what is so needful and serviceable to the comfort of human life, should be cheap and almost every where to be had; but now the Egyptians must either drink blood, or die for thirst. Egypt was a pleasant land, but the dead fish and blood now rendered it very unpleasant. It was a righteous plague, and justly sent upon the Egyptians; for Nile, the river of Egypt, was their idol. That creature which we idolize, God justly takes from us, or makes bitter to us. They had stained the river with the blood of the Hebrews' children, and now God made that river all blood. Never any thirsted after blood, but sooner or later they had enough of it. It was a significant plague; Egypt had great dependence upon their river, #Zec 14:18|; so that in smiting the river, they were warned of the destruction of all the produce of their country. The love of Christ to his disciples changes all their common mercies into spiritual blessings; the anger of God towards his enemies, renders their most valued advantages a curse and a misery to them. Aaron is to summon the plague by smiting the river with his rod. It was done in the sight of Pharaoh and his attendants, for God's true miracles were not performed as Satan's lying wonders; truth seeks no corners. See the almighty power of God. Every creature is that to us which he makes it to be water or blood. See what changes we may meet with in the things of this world; what is always vain, may soon become vexatious. See what mischievous work sin makes. If the things that have been our comforts prove our crosses, we must thank ourselves. It is sin that turns our waters into blood. The plague continued seven days; and in all that time Pharaoh's proud heart would not let him desire Moses to pray for the removal of it. Thus the hypocrites in heart heap up wrath. No wonder that God's anger is not turned away, but that his hand is stretched out still. Moses was a prophet because he spoke with God. Today, he is still speaking through prophets in these last days. Moses had a good education in Egypt. Yet he was not eloquent, still our Lord chose him for his purpose of saving Israel. Today is the same, our Lord is choosing the humble people to do his work. Many disregard the calling because they are distracted in the world. They refuse like Egypt. Verse 1~Jehovah God had made Moses like a god to Pharaoh in regards to the authority he had. Pharaoh didn't worship Moses, but Moses was over Pharaoh in power. "Thou shalt speak all that I command thee: and Aaron thy brother shall speak unto Pharaoh, that he send the children of Israel out of his land. And I will harden Pharaoh's heart, and multiply my signs and my wonders in the land of Egypt." God knows the difference between His servants, His people, and the heathen His enemies. He uses weak to confound the mighty and deliver the oppressed from them. End of day 18 in the "Bible in a Year Reading. Had to play catchup having missed yesterday. I love reading and contemplating these chapters that span the life of Moses. When Moses had to flee from Pharaoh he had to leave everything behind unlike today I can only imagine the hostilities that he could have encountered. God protected him and Moses depended upon God to deliver his people. Verse 3: Jehovah God is spoken of as making Pharaoh's heart hard here. This refers to God allowing Pharaoh's heart to become hard. He did not for Pharaoh to be hard-hearted. God said he made Moses a god unto pharaoh... this is an indication to believers that no matter how big or terrible the mountain or stumbling block that stand before us we should see them as no barrier before us because to God they are powerless and that God has made us a god to them all. The Elect of God, the Faithful in Christ, have now a long time been under subjection to a wicked and perverted world; and the LORD is coming down to deliver us and to judge the world for its evil. The first sign; the rod of Moses turned into a serpent; indicates that God sends the devil to punish the wicked. The waters are then turned to blood because they have filled the land with innocent blood. God is ruler over all. Gods' way will prevail, no matter how hard we try to fight. We have temptations and we sin, but if we repent, we can prevail and live according to how Jehovah wants us to live. NO MATTER WHAT, GOD IS!!!!!! Exodus 7:1 "See, I have made thee a god to Pharaoh." It does not say that God made Moses one of Pharaoh's gods. Pharaoh's gods were false gods. What Do You Think of Exodus 7? How much older was Aaron (Moses' brother) than Moses?